The Hindu: From 10 feet away, it looked like a grin, the row of teeth stretching from ear to ear. Freshly dug out from many layers of soil, the mud-covered skeleton lay on its spine, awaiting a number. “That would be 283,” says W.R.A.S. Rajapaksa. He is standing on an elevation inside the site, located at a busy junction in Mannar, an island town in Sri Lanka’s Tamil majority Northern Province. In his blue smock, the Consultant Judicial Medical Officer at Mannar District General Hospital looks like a surgeon, except that this operation is taking place under the sun, inside a messy soil pit. So he is also wearing a cap and rubber boots. On a Monday morning earlier this month, at least four skeletons were clearly visible at the site, while parts of another were protruding from the soil. Where they lay — some piled one on top of the other and a couple to the side — it was at least two metres below ground level, says Mr. Rajapaksa, chief investigator of the latest mass grave to be found in Sri Lanka. As of Friday (January 18), 300 skeletons, including those of 23 children below the age of 12, have been identified. Members of his team that comprised fellow judicial medical officers, forensic archaeologists and analysts had resumed excavating the skeletons after a break for Christmas and the New Year. Wetting their brushes in a cup of water, they gently pried aside the soil deposits over the bones, making them visible, little by little, to the world they had left behind. “We consider this a scene of crime until proven otherwise,” says Mr. Rajapaksa on what happens to be the 125th day of the excavation, being undertaken following a directive from the Mannar magistrate court. The bodies had been found “dumped”, instead of being “laid to rest” beside each other, as would be the case in a cemetery. In March 2018, construction workers stumbled upon human remains while preparing to build a new outlet for the state-run cooperative Sathosa (in place of its old building that had been demolished). Little did they know that they would be uncovering one of Sri Lanka’s largest mass graves almost a decade after the civil war ended in 2009. Samples will be sent to a laboratory in Miami, Florida, possibly next week, for carbon dating analysis. The process, which is often used in archaeology and forensic study, would ascertain the amount of Carbon-14 in bone and teeth samples. This could help establish the approximate period in which the person lived, before it possibly leads the investigators to the likely year of their death or to those behind it. At 9.45 in the morning, the shops in the area are open and teeming with customers. With the post office, market and the bus terminus all in the same vicinity, a number of vehicles crisscross the grand bazaar area, or periyakadai sandi as the locals call it. Motorists on their way to work slow down and turn their heads 90 degrees to catch a glimpse of the grave site that has drawn media attention to their otherwise neglected town. Pedestrians stop and watch for a few seconds. Perhaps deterred by the uniformed policemen and Special Task Force personnel stationed under a neem tree adjoining the site, some move a safe distance away before pulling out their smart phones for a picture of the ongoing exhumation. 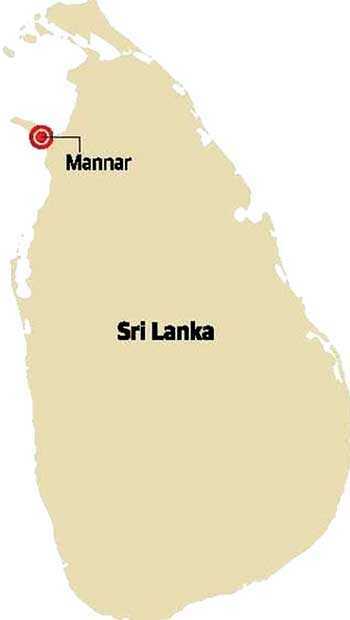 Mannar district, along Sri Lanka’s north-western coast, is part mainland and part small island, connected by a causeway. The mass grave has surfaced at the district’s main town on Mannar island, a thin patch of land jutting into the Palk Strait like a little fin. On the western tip of this little island is Talaimannar, the closest point to Dhanushkodi in Tamil Nadu’s Rameswaram district. Some 30 km apart and with a narrow stretch of the Indian Ocean running between them, Talaimannar and Rameswaram were once connected by a popular ferry service that, since the 1980s, has been defunct. In the nearly three decades of Sri Lanka’s civil war, waged by the state armed forces against the rebel Liberation Tigers of Tamil Eelam (LTTE), both towns bore witness to mass displacement, rough boat rides, and prolonged separation but also a precious solidarity among the common people. The lull in business had little to do with the excavation nearby. Months of erratic weather — a severe drought followed by flash floods — had affected both the harvest and prices, he says. 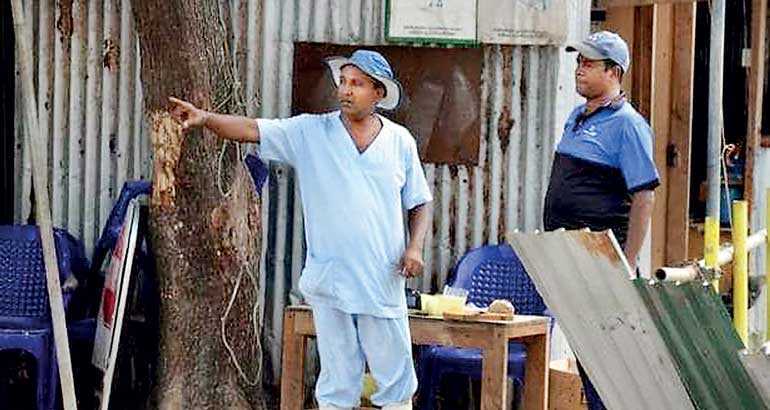 He has been running the stall for 12 years, he says, from the time he returned from Kalpitiya in Puttalam, some 240 km south, where many Muslims like him had fled after the LTTE ordered their expulsion from the north in October 1990. Even at the other shops adjoining the site, managers spoke only of practical hindrances. The trucks bringing their supplies from Colombo now stop at the main road, since the excavation site is cordoned off, along with the lane to these shops. The load is physically carried to the stores by workers, unlike earlier, when the trucks could drive into the lane. For the row of shops here, the implications of having a mass grave unearthed in their midst seemed, at best, logistical. However, for some residents a little further away from the site, the excavation and the sighting of skeletal remains has meant another cycle of distress. Especially if they happen to be like the thousands of mothers looking for a loved one who forcibly disappeared during those tumultuous war years. A war that spanned 30 years, a savage state unleashing mass violence, armed militant groups offering resistance — at times with their own brand of brutality — have meant a massive human cost. The casualties were more than a lakh, as in some estimates. With the unresolved mysteries of the deaths and disappearances of Tamil rebels, activists, journalists, and scores of civilians haunting them for years, the survivors in the north struggle to recover from the everyday imprint of trauma. Even if they choose to look ahead rather than behind, healing is not easy as they strive to make ends meet in a battered economy with no promising jobs and few sympathetic political leaders who chose action over rhetoric. Amarasingam Ranjini’s son, who was in the LTTE, went missing in the summer of 1999. He was born when she was still in her teens following her early marriage. “They [army] took him for questioning, and he has not come back in these 20 years,” she says. While her other son and daughter now live in India, Ranjini, 60, stays in her hometown all alone. She still hopes to see her son one day. “I do believe he is alive somewhere and I will continue looking for him. But when I saw this mass grave site and heard about the hundreds of bodies being unearthed, I wondered if one of them could be my son. The thought did cross my mind,” she says, breaking down, torn between denial and resignation. It was this “double-edged” fear that Sri Lankan-born writer Michael Ondaatje described in his novel Anil’s Ghost. “There was always the fear, double-edged, that it was their son in the pit, or that it was not their son — which meant there would be further searching,” he wrote, of a fictional grave site with submerged bones. Mothers of those who disappeared in the run-up to the final phase of the war in 2009 — many after being reportedly taken by state agencies for “questioning” — are far from accepting that their child could be dead. Those looking for relatives who went missing in the 1990s allow for that option, but have no way to reconcile with it in the absence of evidence, says Jena Jayakanthi, a Mannar-based activist working with the families of the disappeared. “If you haven’t seen your child’s body, how do you begin to believe that he is dead,” she asks. The Sri Lankan Army has repeatedly denied having played a role, but has done little else to explain what happened to those its personnel picked up for “questioning”, or the others who were seen surrendering to its officers. Apart from the troubling reality of unresolved cases of enforced disappearances coexisting with unexpectedly found human remains in the heart of town, the mass grave has also set off considerable speculation within and outside Mannar. Stories travel, supplemented by recollections of senior citizens —some of whom remember a bank building at the site before the now-demolished cooperative store was built — and acquiring new details and narratives. Home to nearly one lakh people, mostly Tamils (Catholics, Hindus) and Tamil-speaking Muslims, Mannar is the most religiously diverse district in the north. During the war, the LTTE was in control of mainland Mannar, part of the Wanni region sandwiched between the Sinhala-majority south and the northern Jaffna peninsula. On the other hand, Mannar island itself was, for the most part, under the jurisdiction of the Army and the Navy, recalls Ranjini, quickly pulling out her 1999 “Army IC” or the identity card distributed by the Army, that was used to keep track of those moving between Mannar island and the mainland. The Government set up the Office on Missing Persons (OMP) in 2016 to investigate the scores of cases of missing persons, reported from both the former war zones in the northeast, and during the State’s ferocious crackdown on radical Sinhala youth in the south in the late 1980s. Amnesty International estimates a total of at least 60,000 disappearances in the country. The exact number of missing persons from Mannar is not clear. The OMP has so far not put out lists or numbers, perhaps because its own task includes comparing and verifying figures mentioned in previous lists compiled by other commissions. Says OMP Chairman Saliya Pieris, “The OMP has been acting as an observer in this case since June 2, 2018 as it is a mass grave site that may relate to cases of disappearances and missing persons that fall under our mandate.” The office stepped in last year to financially support the excavation efforts and will also help transport the samples to the laboratory in Florida. It was in March 2018, just around the time of the United Nations Human Rights Council (UNHRC) session in Geneva, that Sri Lankan President Maithripala Sirisena appointed the commissioners to the OMP. The OMP has held at least seven public sittings in different districts in the war-affected north, east and the south, where disappearances have been reported. The last time mass graves were alleged in Mannar was in late 2013, near the famed Thiruketheeswaram Shiva temple, and later in 2016, in a well not far from this temple. The investigation into the 2013 ‘sighting’ by the residents of the area is yet to be completed, with some officials reportedly declaring the grave to be a part of a cemetery. For locals, though, questions linger. In the 2016 case, investigators told the magistrate court that there were no human remains. The inquiry into the Matale mass grave found in 2012 in the island’s Central Province has also stalled, despite the left-wing Janatha Vimukthi Peramuna’s (JVP) demands for a full investigation of the site where, some believe, its activists and sympathisers could have been interred during the state repression of the JVP in 1971 and again in 1987-89. 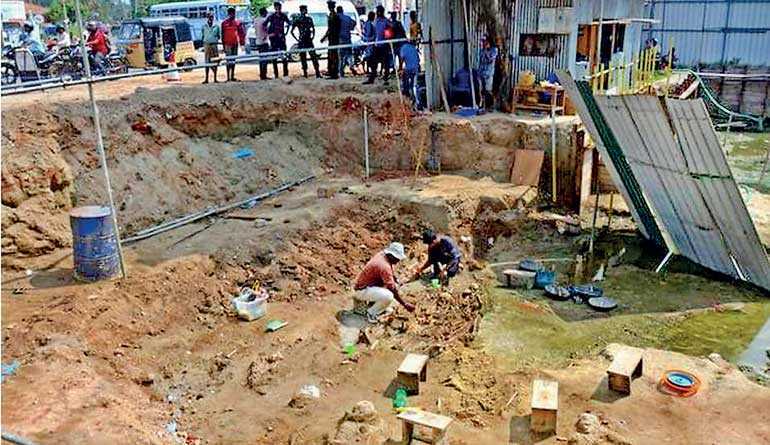 Yet another mass grave in Kaluwanchikudy was found in the eastern Batticaloa district in 2014, but the excavation did not see much progress. He says, “We haven’t finished excavating yet. We will continue until we get to what we call a bone-free margin, to rule out any more bones,” suggesting that the number of skeletons could increase further. His observation echoes those of many mothers who desire to unearth the truth buried with the bodies. Until then, they will remain bare bones, carefully wrapped and safely stored, bearing only a number.